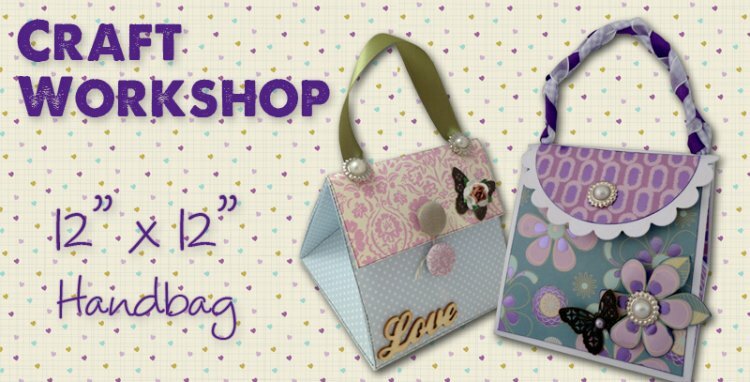 This cute little handbag is easy to make out of one sheet of 12x12 paper and is a useful technique for making gift bags. Download our free template and keep for future use! 2. Mark at the edge of the card at 6” and as shown on the template, score to the crossover points. At these same crossover points score to the outer edge of the 12” square on both sides diagonally to create a ‘W’ in scored lines. Repeat on the opposite side of the card. 3. As shown cut away the four corner sections of the cardstock. 4. Ensure that the scored fold lines on the ‘W’’s are folded as valley folds and all straight folds are mountain folds. 5. Create a ‘flap’ from 4” x 4” cardstock and score in half at 2”. Adhere one side of the flap to the main 12x12 bag. 6. Add ribbon as a handle and secure with brads. 7. Create a clasp using a magnet or Velcro. Alternatively use two brads (one on the ‘flap’ and one on the ‘bag’). Tie some twine around the ‘flap’ brad and wrap around the other brad to secure in the closed position.